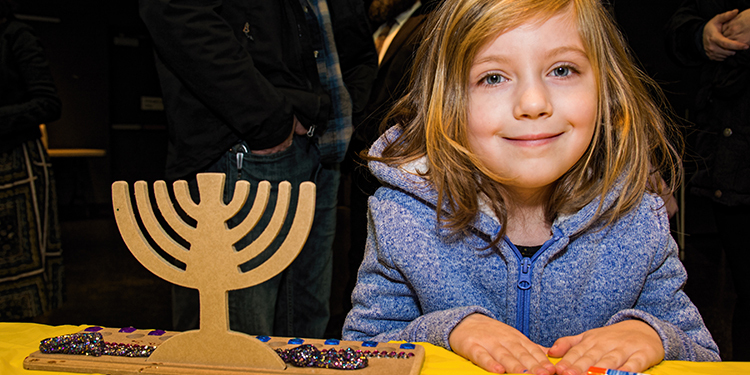 Ava Shmilovitch, 6, is about to decorate her Menorah at the 30th anniversary lighting ceremony to kick off Chanukah. Thirty years ago, the first Menorah lighting ceremony was held in Richmond to mark the beginning of Chanukah. On Dec. 2, 2018 the festivities took place on the cultural centre plaza in front of the Brighouse branch of the Richmond Public Library where the traditions, music and culture of the Jewish faith of this annual celebration were shared with the community. For event organizer Joe DaSilva, it was a particularly poignant moment. “In the 30 years I have organized the Menorah lighting event, Helmut and Hugo Eppich’s commitment and resolve to sponsor the yearly Menorah lightning has never diminished but grown stronger,” he said. The 25-foot tall Menorah is one of the largest in the world. Designed by renowned Canadian architect Arthur Erickson, it was commissioned by Helmut and Hugo Eppich who founded the Ebco Group of Companies based in Richmond.